I have learned, as an inveterate church-visitor, to accept that old churches have had to evolve in order to accommodate changing usage, and that such evolution continues. Many of the buildings are medieval, and since they were built churches have acquired now-common features such as vestries and organs that take up space or mean that parts of an ancient building have had to be adapted for new purposes. The locations of major fixtures and fittings – seating, pulpits, screens, the main altar – may have changed. And church buildings may have to accommodate such facilities as kitchen areas, children’s corners, and the Mothers’ Union noticeboard. Much as I might find some of these things intrusive, in years of church-crawling I’ve learned to look around or beyond such distractions, and have found rewarding carvings in vestries, stained glass behind organs, and monuments in all sorts of places. I have benefitted from the hospitality of vicars and churchwardens, who have ushered me through locked doors to find hidden Norman doorways and Saxon crypts. * And I have occasionally quietly moved notices and bits of freestanding furniture so that I can get a better look at things, before carefully replacing them. At Farthinghoe, I was enticed by a plinth and a bit of carved drapery poking out from beneath a pinboard containing all kinds of notices to do with the choir, the Parochial Church Council, and the Mothers’ Union. This noticeboard was set upon a table that was to one side of the drapery; to the other side was a white, formica-covered shelving unit. It didn’t feel right for me to move either of these pieces of furniture, but the noticeboard was not attached to the wall, resting only on the table, and could easily be shifted to one side. What was behind it is in my photograph. 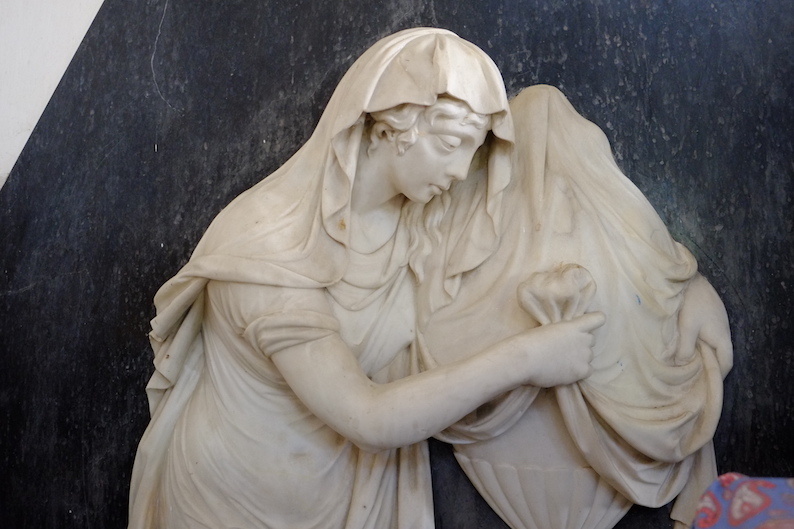 It’s the monument of Henrietta and Catherine Rush, unmarried sisters, who both must have died in or around 1801. The accompanying tablet, of which I caught sight at the other side of the table, says that the monument was ‘erected by their afflicted father, 1801’.† Pevsner adds that the monument has been broken into two parts – two parts comprising the figure and the tablet, presumably, though I couldn’t work this out fully because I couldn’t quite see what was going on behind the furniture. But at least I could appreciate the delicate carving of the figure and urn, the pretty if rather stylised face, the folds of drapery, the fluted pattern on the urn. If I’m occasionally irritated by the inelegant impedimenta of the working church, I console myself with the thought that this at least means that the building is used…although I also remember with sympathy the exasperated words of Pevsner, finding a church full of worshippers who made it impossible for him to examine the building properly: ‘Really, the uses some people put these buildings to...’¶ It was, of course, partly the great man’s joke about himself. So it was with a wry smile at least in part at my own expense that I carefully replaced the noticeboard, tiptoed out into the sunshine, and went on my way, grateful for what I’d seen. * And sometimes at inconvenience to themselves, to help someone who had turned up out of the blue; I am humbled. On one occasion I was chilled to be shown a crypt full of human bones, a sight I have not yet found it possible to write about. † The father, George Rush, has his own monument, another stunner, to which I will return. ¶ The remark was remembered by Pevsner’s collaborator Bridget Cherry and is quoted in Susie Harries’s excellent biography of Pevsner; see Nikolaus Pevsner: The Life, p. 541.